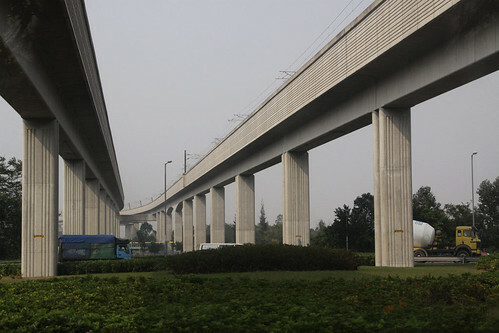 The West Rail Line was originally built by the Kowloon-Canton Railway Corporation (KCRC), having opened in 2003. 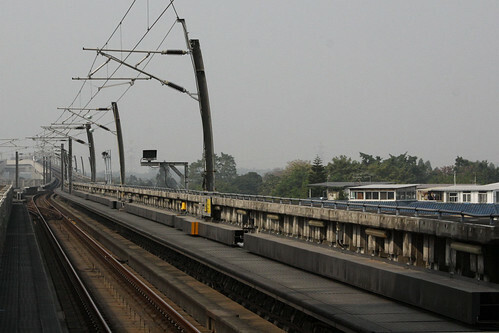 It operates as a metro type service, with only one type of train operating along the line, unlike the East Rail line, which also saw freight and long distance passenger services using it. The section in Kowloon is located in tunnel, while that in the New Territories is above ground on viaducts. 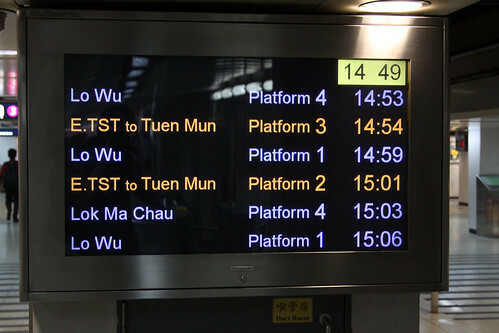 The line was built in three sections: the initial stage was from Nam Cheong at the city end, to Tuen Mun in the New Territories. The second stage was from Hung Hom to East Tsim Sha Tsui which operated as part of the East Rail Line from opening. The final stage linked East Tsim Sha Tsui to Nam Cheong, with Hung Hom becoming the city terminus. 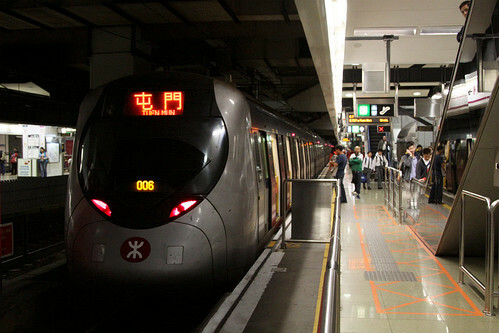 Hung Hom remains the city terminus of the line, with cross platform interchange provided with the East Rail line. Two island platforms are provided at the station, with each island having one side dedicated to East Rail, the other side to West Rail. 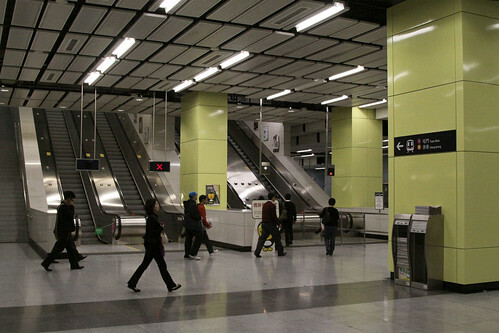 Hung Hom is also the only West Rail line station to not have platform screen doors. The line ends in a set a baulks at the far end of Hung Hom, but a single track connection it provided with the East Rail for transfer moves. 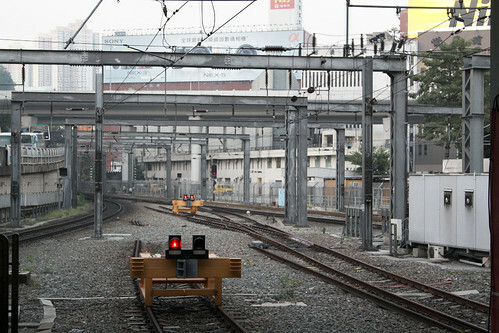 Both lines use the same track and overhead standards, but use different Automatic Train Operation systems. For this reason the trains are normally isolated on their own lines, even though similar units are used on other parts of the former KCRC network. 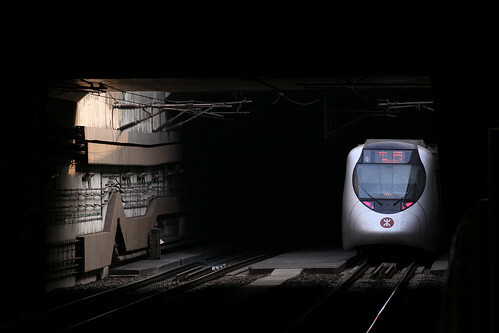 The tunnels then lead to the next station of East Tsim Sha Tsui. East Tsim Sha Tsui is linked to Tsim Sha Tsui station on the Tsuen Wan line by an extensive series of underground corridors and travelators: I didn’t get around to photographing them. 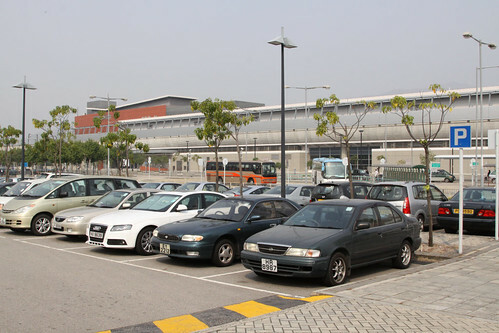 Austin station follows: originally called West Kowloon, it is a short distance from Kowloon station on the Tung Chung line, and adjacent to the future terminus of the high speed rail link to China. 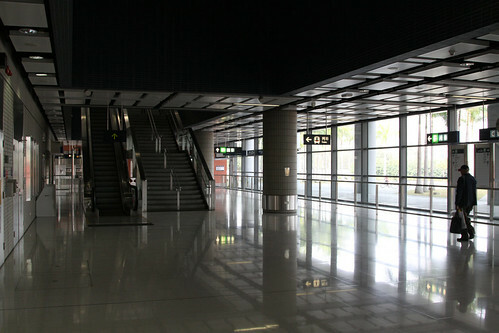 The station is in the middle of the West Kowloon Reclamation, the majority of which is currently bare land awaiting development – as a result the station feels like a ghost town when passing through. 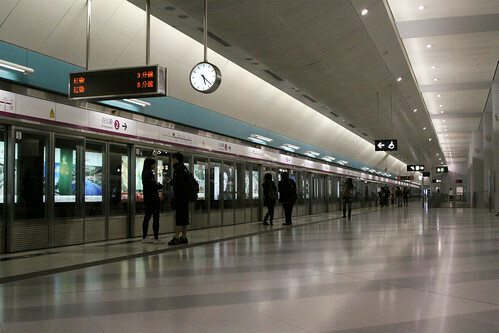 Nam Cheong station is next, and is an the interchange with the MTR. 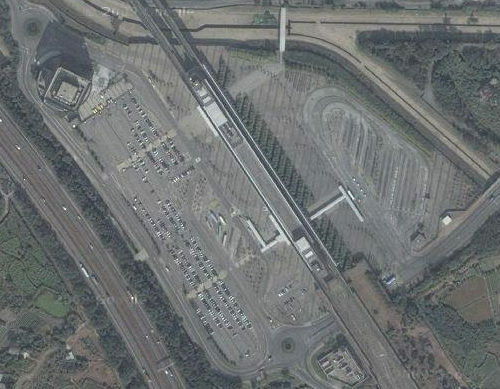 Despite being only seven years old, the station would have to be one of the worst designed in Hong Kong – being built as what was effectively two separate stations. 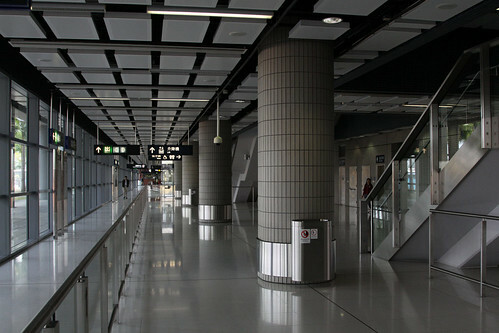 The Tung Chung and West Rail lines have separate sets of side platforms, the original interchange between them being provided by the concourse at the lower level. This was because of the different fare systems in use on the MTR and the KCR, with passengers needing to pass through ticket barriers when changing lines. The station would have made a lot more sense if the West Rail platforms flanked those of the Tung Chung line: this would have allowed cross platform interchange in both directions. 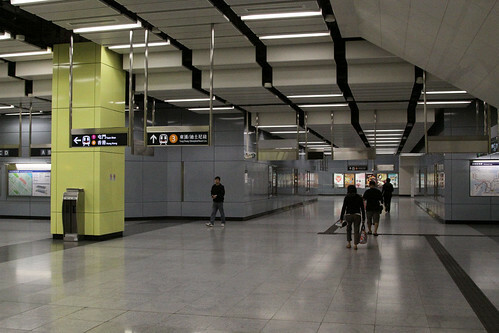 Today cross platform interchange exists in one direction, between northbound West Rail Line trains and southbound Tung Chung trains – a number of passageways were punched through the dividing wall between platforms soon after the MTR and the KCR were merged. After doing this, they rail operators felt it was important enough to warrant a TV advertisement (note a Harry Potter lookalike at the 1:20 minute mark of the video). Beyond here Mei Foo and Tsuen Wan West stations are encountered: the former is another MTR interchange that lacks cross platform interchange. The line then passes through the Tai Lam tunnel and emerges in the New Territories. 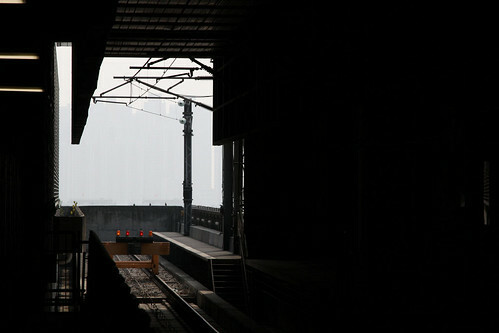 The line then rises onto a viaduct at Kam Sheung Road, which is a massive railway station out in the middle of nowhere. 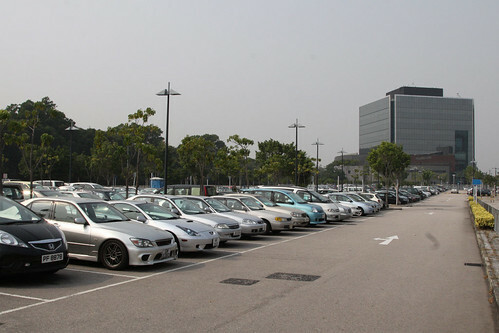 It is located midway between two small villages, and has a massive park and ride alongside – note the car park is not free. This station would be the best example of the massive level of overengineering on West Rail: the line is relatively quiet by Hong Kong standards but the stations have been designed for much higher levels of patronage. Beyond here the line continues on massive viaducts over marshland and villages. Noise reduction was a big concern when building the railway, with noise baffles located between the tracks and along the inside of the viaducts to cut down the noise. Unfortunately this also makes life difficult for ground level photography, as the viaduct walls reach the window level of the trains to further reduce the noise produced by the line. By Yuen Long station the line then moves back into typical Hong Kong suburbia, surrounded by an endless forest of highrise apartment blocks. The common design of the stations makes West Rail a rather boring line to photograph. 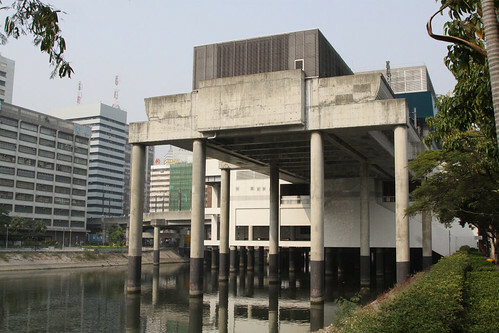 The end of the line is Tuen Mun: the station is located atop a river. That marks the end of the journey – the line doesn’t really go anywhere of tourist interest, but from out of the window it gives you a really good look into what Hong Kong suburbia looks like. This entry was posted in MTR line guides, Transport and tagged Hong Kong, KCR, Kowloon Canton Railway, line guide, Mass Transit Railway, MTR, New Territories, trains. Bookmark the permalink. Interesting page. When will you cover the Seltrac signalling used on the West Rail Line? I don’t think I’ll be able to write anything on it – I didn’t get many photos of the signalling equipment on West Rail, and I haven’t been able find any papers covering the technical details. That’s a shame. As far as I can gather the last time I’ve been there, it is mostly a cab based system (being Seltrac) with only basic stop/go signals on the line (White upward pointing arrow and a red horizontal bar or a cross. I can’t remember). The closest to any form of details seems to be wikipedia and their page here. I have always wondered who’d park their car at the station in the middle of nowhere, it’s only got villages nearby. I’m guessing the village residents might use the station as a park and ride when heading into town. This line is more heavily used nowadays, especially during rush hours. It is only one of the few lines now at over 100% capacity at a 4 people per square meter measurement even with the addition of an 8th car.